The wandering albatross, snowy albatross or white-winged albatross (Diomedea exulans) is a large seabird from the family Diomedeidae, which has a circumpolar range in the Southern Ocean. It was the first species of albatross to be described, and was long considered the same species as the Tristan albatross and the Antipodean albatross. A few authors still consider them all subspecies of the same species. The SACC has a proposal on the table to split this species, and BirdLife International has already split it. Together with the Amsterdam albatross, it forms the wandering albatross species complex. The wandering albatross is the largest member of the genus Diomedea (the great albatrosses), one of the largest birds in the world, and one of the best known and studied species of bird in the world. 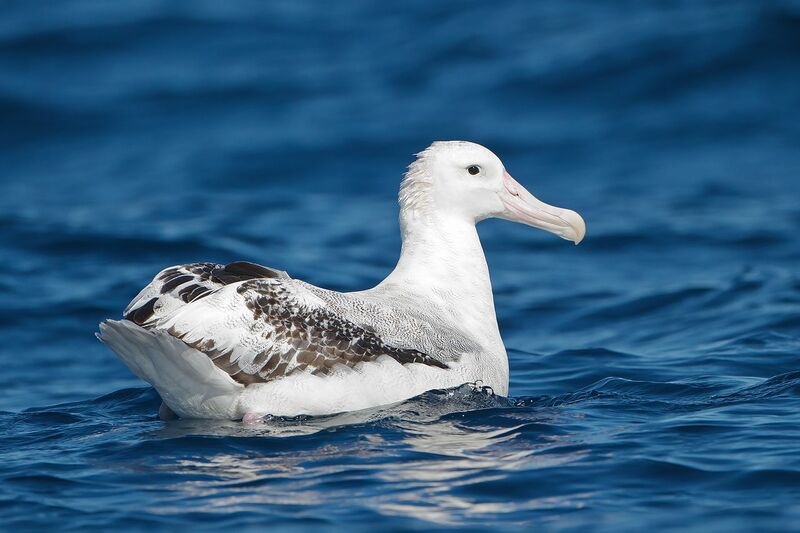 Some experts considered there to be four subspecies of D. exulans, which they elevated to species status, and use the term wandering albatross to refer to a species complex that includes the proposed species D. antipodensis, D. dabbenena, D. exulans, and D. gibonsi. Diomedea refers to Diomedes whose companions turned to birds, and exulans or exsul are Latin for “exile” or “wanderer” referring to its extensive flights. Wandering albatrosses spend most of their life in flight, landing only to breed and feed. Distances traveled each year are hard to measure, but one banded bird was recorded traveling 6000 km in twelve days. The wandering albatross has the largest wingspan of any living bird, typically ranging from 2.51 to 3.5 m (8 ft 3 in to 11 ft 6 in), with a mean span of 3.1 m (10 ft 2 in) in the Bird Island, South Georgia colony and an average of exactly 3 m (9 ft 10 in) in 123 birds measured off the coast of Malabar, New South Wales. On the Crozet Islands, adults averaged 3.05 m (10 ft 0 in) in wingspan. The longest-winged examples verified have been about 3.7 m (12 ft 2 in). Even larger examples have been claimed, with two giants reportedly measuring 4.22 m (13 ft 10 in) and 5.3 m (17 ft 5 in) but these reports remain unverified. As a result of its wingspan, it is capable of remaining in the air without flapping its wings for several hours at a time (travelling 22 m for every metre of drop). The length of the body is about 107 to 135 cm (3 ft 6 in to 4 ft 5 in) with females being slightly smaller than males. Adults can weigh from 5.9 to 12.7 kg (13 to 28 lb), although most will weigh 6.35 to 11.91 kg (14.0 to 26.3 lb). On Macquarie Island, three males averaged 8.4 kg (19 lb) and three females averaged 6.2 kg (14 lb). In the Crozet Islands, males averaged 9.44 kg (20.8 lb) while females averaged 7.84 kg (17.3 lb). However, 10 unsexed adults from the Crozets averaged 9.6 kg (21 lb). On South Georgia, 52 males were found to average 9.11 kg (20.1 lb) while 53 females were found to average 7.27 kg (16.0 lb). Immature birds have been recorded weighing as much as 16.1 kg (35 lb) during their first flights (at which time they may still have fat reserves that will be shed as they continue to fly). On South Georgia, fledglings were found to average 10.9 kg (24 lb). Albatrosses from outside the “snowy” wandering albatross group (D. e. exulans) are smaller but are now generally deemed to belong to different species. The plumage varies with age, with the juveniles starting chocolate brown. As they age they become whiter. The adults have white bodies with black and white wings. Males have whiter wings than females with just the tips and trailing edges of the wings black. They also show a faint peach spot on the side of the head. The wandering albatross is the whitest of the wandering albatross species complex, the other species having a great deal more brown and black on the wings and body as breeding adults, very closely resembling immature wandering albatrosses. The large bill is pink, as are the feet. They also have a salt gland that is situated above the nasal passage and helps desalinate their bodies, due to the high amount of ocean water that they imbibe. It excretes a high saline solution from their nose.